Buddy is a gorgeous hunk of horse, and he is also a fully registered Quarter Horse with a perfect registered name for a chunky plain bay! 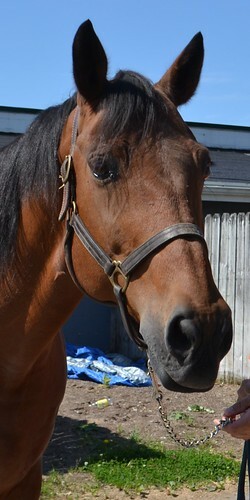 He has been a track pony horse, accompanying the TB race horses to the track for morning exercise and afternoon races. He has excelled at that job, and has been a particularly good steadying influence helping his owner/trainer to teach her two year olds the racing game. 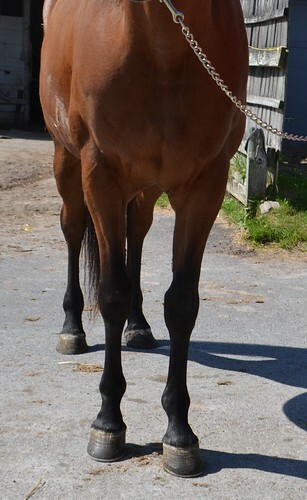 But with a full stable of race horses at the track and more at the farm, Buddy’s owner finds herself without enough time to devote to him anymore, and she wants him to find a new job because he is far too nice a horse to just hang out around the racing stable. She says Buddy is very sound and does it all — he neck reins, moves off the leg, calms hot horses, handles commotion around him, is very comfortable to ride, and is always a quiet good guy. He is a very easy keeper, as the photos demonstrate. 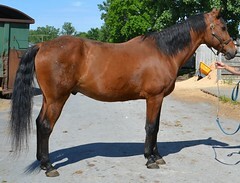 His owner says he gets by on a handful of grain, and hay. She says he loves treats, and he’s great with other horses in turn out, unless you try to feed them all in the pasture — then Buddy will try to take all the food. 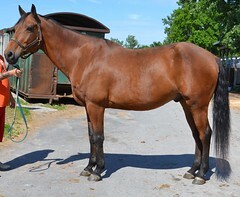 She thinks Buddy would be a great trail horse, but with his good looks and beautiful movement, we also think he can excel in the hunter ring or in dressage. For his jog video. Buddy showed off a light, lofty trot with lovely suspension and reach that quite impressed us. With his stout physique and big barrel, Buddy will take up the leg of taller riders. Husband horse perhaps?